Will Blocker hit his first high school homer and the team's first dinger of the season last week. Photos by Kyle Thornton. 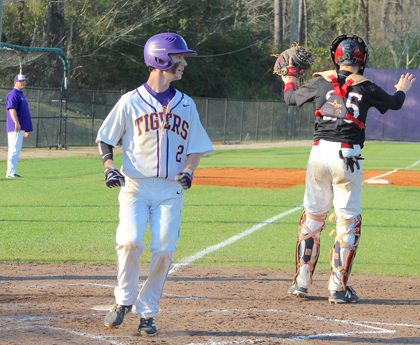 After a stretch of scoring just six runs over six games vs. some of the top pitching prospects in high school baseball, Tallassee picked up its hitting and reeled off three straight wins scoring a total of 32 runs. 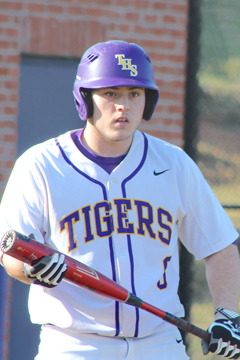 The Tigers beat Stanhope Elmore 7-3 on Tuesday, Robert E. Lee 13-1 on Wednesday and Park Crossing 12-2 on Friday. At Southside Field against the Mustangs from Millbrook, Beau Baker picked up the win with four innings pitched. he struck out 5 and walked 2, allowing 2 earned runs on six hits. Jacob Dantro got the save with 3 innings pitched, no earned runs, no hits, a walk and four strikeouts. Will Blocker was 2-for-3 with a double. Jace Taylor added pinch hit single and RBI. Bruin Hathcock got the win against Lee in Montgomery. He also was 3-for-3 at the plate with a double. Jackson Gantt went 3-for 3. Blocker was 3-for-4 with a double. Back in Tallassee vs. Park Crossing for its third game in three days, Gantt recorded the win with 4 innings of work and 4 strikeouts. Blocker hit his and the team's first homerun of the season, a two-run shot. He walked three times. Gantt was 3-for-3 with a double and 2 walks. Baker went 2-for-4 with a two-bagger. Bailey Sharp was 2-for-4. Tallassee (6-9) plays Creekwood, Tenn. in a doubleheader on Thursday, March 21 at Wetumpka beginning at 4 p.m. Spring Break week follows with the Tigers' first area action scheduled the following Thursday, March 28 at Valley. The game will be at 11 (Central Time). The next day, Tallassee will play the Rams again in a doubleheader in Tallassee starting at 11.